The Amazon rainforest spans nine countries and millions of square kilometers. Due to deforestation, current estimates indicate only about 80 percent of the original rainforest remains. 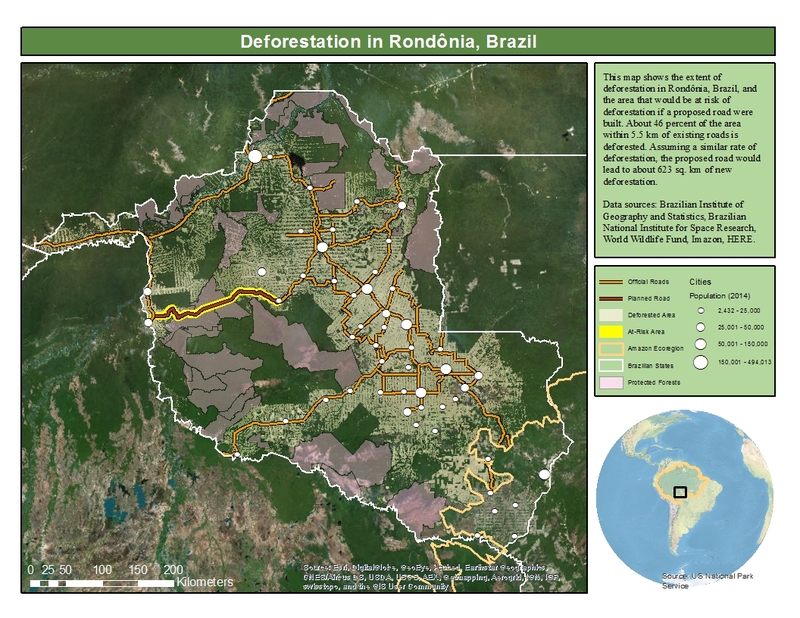 In this lesson, you'll use ArcMap to create a map of deforestation in the Brazilian state of Rondônia. Then, you'll predict how much deforestation would be caused by a new road proposed to be built across the state. Your workflow requires a wide variety of data, feature editing, and analysis tools. You'll also learn how to share your results as an informative print map. Data on roads was acquired from Imazon with help from Carlos Souza. Data on the Amazon ecoregion and protected areas was acquired from World Wildlife Fund (WWF) with help from Aurélie Shapiro. Find suitable corridors to connect dwindling mountain lion populations. Get an introduction to the basic components of a GIS. Learn fundamental concepts that underlie the use of a GIS with hands-on experience with maps and geographic data. Master commonly used tools to map, analyze, maintain, and share GIS data and information products. Learn core GIS concepts that will help you create accurate maps and produce reliable analysis results. Learn techniques to enhance exploration of your data and prepare data for analysis. You will also learn how to increase the usability of a GIS map.